Many people we talk to understand that managing media content is critical, but worry about the cost of media asset management systems. Certainly not surprising, as purchasing MAM software is very expensive. But have you ever thought about the cost of not using media asset management? Our MediaPhile managed service could be the alternative. The cost of having a system is immediately noticeable. You see it on an invoice. The cost of not having a system isn’t so obvious, but it’s certainly real. And not only financial. $8,200. That’s a big number! Convert to Australian dollars and it’s over $10,000 per person per year. Hard to believe? Let’s do a sanity check. 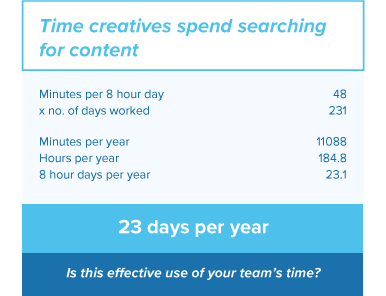 How much time do you spend on an average day looking after – or looking for – media content files? That includes searching, verification, organisation, back-up and security. Let’s take 20 minutes a day as a starting point. It doesn’t sound like much, but when you do the sums, it adds up to over 10 days a year. How much is two weeks of your time worth? There’s no hard and fast rule, but previous WorkPlace Info surveys suggest your time costs 35-40% more than your actual salary. 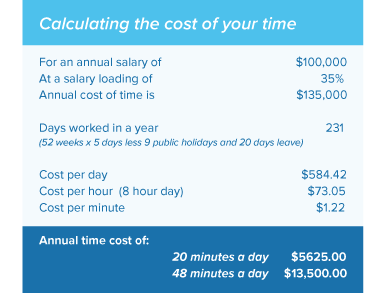 If you’re earning $100,000 a year and you spend 20 minutes a day on file management, that costs over $5,000 a year in your time alone. But is it only 20 minutes a day? The research found ‘creative professionals spend 1 hour in 10 on file management, mainly searching’. Based on an 8 hour day, that would be 48 minutes a day. It adds up to 23 days a year. A total annual cost of $13,500. The GISTICS numbers seem to make sense. Now ask, how many people in your organisation spend time managing content? Two? Three? Five? Ten? Suddenly the annual cost of media asset management gets terrifying. 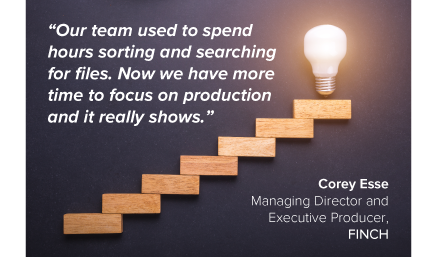 Will a media asset management system save you all that cost? The short answer is no. It will save you some of that cost, not all of it. However great the system, you’ll still have to spend some time on media file management. Media may be stored in multiple places. Different servers. Someone else’s hard drive. With an agency. Some of those places may be hard to access. Or impossible. You may not have permission. It can be hard to identify the file you want. Especially if you’re looking for images or video, and the search interface isn’t visual. Or if you don’t have the software to open a file and look at it. There may be close variations of the same file and you can’t easily see which one is the one you want. Think logos of different sizes. Or videos formatted for different publishing channels. Or two variations of an ad. A well-designed visual interface with strong search capability can save you a lot of time! The cost of your time is only one way your media asset management practices affect your business. Have you considered these others? What else could you do with that time you spend searching for media files? You could create a new campaign. Take on another billable project. Take a holiday and come back refreshed. All those opportunities are lost because you’re spending time managing files. What happens when you can’t find the media you’re looking for immediately? Your client’s breathing down your neck for a particular TVC that you made last year which they want to include in a presentation. You can’t find it. What happens to your relationship? You need some additional footage from a different camera angle and the hard drive’s gone AWOL. You want to respond to a tweet and you have just the clip to make your point, but you can’t find it anywhere. Now the moment’s gone. You can’t find a TVC you want to post on social media. You changed creative agency and you have to call your ex-agency and ask them to send you another copy. You’re not exactly their number one person. Sometimes you just can’t do what you wanted to. Sometimes you can, but it takes longer than it should have. In addition to delays and potential missed deadlines, you experienced stress and frustration. That often impacts productivity. Especially for creatives who need a good state of mind for imaginative work. You can recreate the content. How long will that take? Is it practical for whatever you planned to do with the content? How much will it cost? And is it even possible to recreate the same content? There may be some ‘near enough’ content you can settle for. You can revise your project to use different content. You can give up altogether. All those options involve cost, delay or missed opportunities. They all come with a price. Whether you adopt a media management system or not, managing your media comes with a cost. It’s just that sometimes the cost isn’t very visible. So if you’re thinking about how to handle your media, work out what that’s costing you right now. In time, lost opportunities and stress. Then you have a good baseline for comparison with any new solutions you assess. And if you’d like to find out more about how our solution MediaPhile works, please reach out and ask us. We’d be happy to organise a demo.